Celebrate enduring love with this sparkling stunning channel set diamond eternity ring with a diamond weight totalling 1/2 carat, crafted in 18ct gold with a secret diamond on the inside of the band. The Forever Diamond has a unique cut made up of 73 facets for exceptional sparkle and radiance and is independently certified by the GSI for colour, clarity, carat and cut. 18ct Gold 1/2 Carat Forever Diamond Ring is rated 5.0 out of 5 by 2. Rated 5 out of 5 by Anonymous from Stunning Ring - excellent quality of the diamonds, they really sparkle I absolutely love this eternity ring my husband has bought for me. The diamonds really shine and look lovely with my engagement ring. 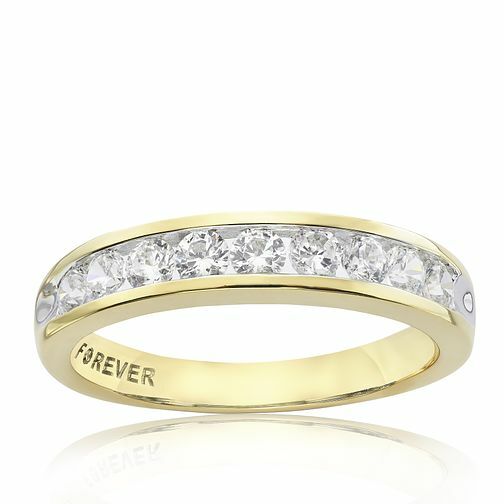 This is part of the Forever collection and the diamonds really sparkle. When I went into H Samuel to look at the Forever collection, they also took the trouble to clean the diamond jewellery that I was wearing. Excellent service and excellent product. I hope to go back to purchase more of this collection in the future.